Add some spice into your kid’s bedroom with the Glowpets Nightlights from Prezzybox. After all, they’ll definitely bring some comfort to little ones who are afraid of the dark. 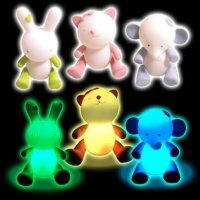 Glowpets night lights are soft, luminous animal night-lights that reassure young children with their comforting glow. These soft animals slowly change colour through pinks and greens, oranges and reds! Glowing gently they take the black out of the night and make a rainbow of the evening. They are made specifically for young children in mind with low-consuming LED’s so the Glowpets don’t get hot. Your little treasures can carry Glowpet with them wherever they choose. You will be able to choose from Bunny, Kitten and Elephant designs, each retailing for £19.95.